Our state flags are very competitively priced. Other than Texas, Washington State and Oregon, 2' x 3' and 3' x 5' flags are mostly uniform in price for all states. The cost of larger sizes is linked to their "CLASS" designation. To view best images and information of all state flags, go to the Annin Flag Company's site. For cotton, polyester, or sizes > 6' x 10', please call or E-mail us for prices. 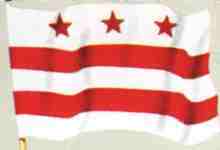 SPECIAL: Limited number of 4' x 6' Delaware state flags, cotton, are now available for only $25. These are somewhat older pressings, very suitable for wall hanging, bed throws, and other decorative uses. For sizes > 6' x 10', please call (302.258.4335) or E-mail (sales@flags-over-lewes.com) for prices. $1 for each additional flag in the order.